Let's face it, golf balls are the ink toner cartridges of the golf world. You spend a lot of time thinking about that $500 driver but you use up more than $500 worth of golf balls every year because of your terrible play. Plus golf balls are freaking expensive. $40-50 for 12 of em??? No wonder then that the used market for golf balls is so huge. Golfers want quality but considering how much we go through golf balls, don't want to pay an arm and a leg for it. Look at the mania that happened when Costco came out with their Kirkland golf ball. Quality golf balls for a reasonable price? People went mad for them! There are many used golf ball places out there on the Interwebs and I have tried them all. 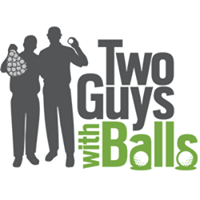 Something drew me to the bespoke used golf ball site of Two Guys With Balls and I am glad it did. Two Guys carefully go through golf balls, wash em up and have an easy to follow grading system (rather than the AAA, AAAAA, etc. out there). Eagle is basically brand new. Birdie is good but a little scuffy. Par is playable but definitely dinged up. So how do the balls actually do "in the field"? Fantastic! Performed just like new balls, I am fan. If you buy through them, you are also supporting a great cause as they donate part of their profits to Arnie's Army. 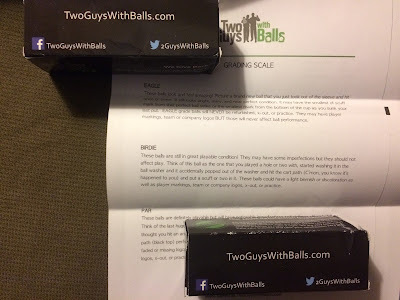 Overall, I really enjoyed my experience with Two Guys and have the page bookmarked for further reloads of my golf balls needs. That reminds me, I need to buy some more ink fo rthe printer. A lot of the best golf balls 2018 has to offer come in alternative versions that spin slightly less for players who prefer a firmer feel or more control off the tee. Try both types from a range of distances to find your preference.